The Sahasrara, or white lotus, is located either at or slightly above the top of the head. The Sahasrara is described as having 1,000 multi-colored petals, which are arranged in 20 layers, each layer with approximately 50 petals. 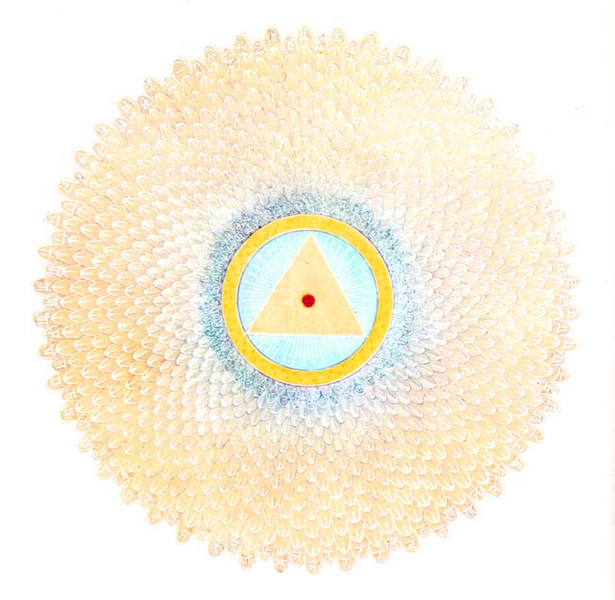 The pericarp is golden and within it a circular moon region is inscribed with a luminous triangle, which can be either upward- or downward-pointing. The Sahasrara Chakra symbolizes detachment from illusion; an essential element in obtaining higher consciousness of the truth that one is all and all is one. Often referred to as a thousand-petaled lotus, it is said to be the most subtle chakra in the system, relating to pure consciousness, and it is from this chakra that all the other chakras emanate. When a yogi is able to raise his/her kundalini, energy of consciousness, up to this point, the state of Nirvikalpa Samadhi is experienced. This stage is said to bring about rebirth or the siddhis - occult powers of transforming into the divine, and being able to do whatever one wishes.